Age of Heroes Blu-ray Review. Age of Heroes is a different look at the war, but it lacks the foundations of a great movie, more character development and worrying about this movie rather than a sequel might have saved it; but unfortunately you’ll probably forget it once it fades to black. Based on a true story, Age of Heroes stars Sean Bean and Danny Dyer in a World War II action movie following the troops of Ian Fleming’s 30 Commando Unit through their first mission “Operation Grendel”. Corporal Bob Rains (Danny Dyer – Human Traffic) enlists into a newly formed 30 Commando Unit created by Ian Fleming (yes the James Bond Author, then a Lieutenant Commander in WWII). Rains and his fellow soldiers are put to the test and pushed to their limits when trained by Sargent McKenzie (William Houston - Sherlock Holmes) and Major Jack Jones (Sean Bean - Game of Thrones) for their first mission, to seize Nazi Radar Technology and be the front line of the allies advance in to Europe. Hot on the tail of the Commandos are vicious German Unit lead by Lt. Steiner Mortensen (Aksel Hennie – Head Hunters). Since Saving Private Ryan there has been dozens of WWII action movies and with so many being released every year it’s hard to stand out, this direct to video flick tries to fit into that nice whole that Inglorious Bastards left back in 2009 with varied results. 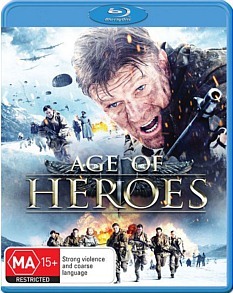 It packs a huge ensemble cast of B Grade British actors ranging from Sean Bean to William Houston; Now don’t get me wrong there is little wrong with any of the acting in Age of Heroes it’s just one of those movies where you will watch it thinking hey I’ve seen you before, what else are you in? Age of heroes finds its footing in the story, while lacking the explosions and brutality of others in its genre Age of Heroes is an intriguing look into another side of the war whereas here we learn how alliances are formed and the commandos are trained rather than just being placed into the battlefield. The pacing of Age of Heroes is difficult to watch with a great opening, the film just drops and we are forced to sit through an hour or so of useless dialogue that does little to drive the film, the final act however wakes you into an action packed final stand between the allies and axis. Age of Heroes tries to mimic certain aspects of Inglorious Bastards with the Character of Lt. Steiner (Hennie) everything from his persona and dialogue to the scenes he appeared in, felt like a poor man’s Jew Hunter played by the memorable Christoph Waltz. I always find with movies like this, with such a big cast they lack in developing characters and giving them the right amount of screen time so when or if they die I actually feel for them rather than just knowing they are cannon fodder. The film comes to a sudden halt towards the end not really divulging on what really happened to characters and giving the sense of a potential but unlikely sequel. With a movie like this I would had preferred the running time to had been extended then It would had got the character development and the true ending it needed. Age of Heroes is a different look at the war, but it lacks the foundations of a great movie, more character development and worrying about this movie rather than a sequel might have saved it; but unfortunately you’ll probably forget it once it fades to black.